Eastern red cedar is a small to medium-sized tree, aromatic, evergreen, with a dense, pyramidal (sometimes cylindrical) crown. Leaves, usually at the end of twigs, are minute, either scalelike or needlelike, olive green to yellowish-green, turning bronze after the first frost and staying somewhat reddish through winter. Trunk is single, tapering; trunk spreads at the base. Bark is light reddish brown, shredding into long, thin, flat strips, the trunk tapering toward the top and spreading at the base. Twigs are flexible, green the first year, reddish brown the second year, aromatic. Conifers don't technically flower, but pollen is shed March–May. Male and female cones usually on separate trees; male cones small, often abundant, golden brown, produced at tips of twigs; female cones smaller, purplish, about 1/16 inch long. Fruits August–September; female cones become fleshy, berrylike, about ¼ inch long, dark blue, covered with a white, waxy coating, globe-shaped; flesh sweet, resinous, with odor of gin; seeds within the cone 1–2. Similar species: Missouri has one other native juniper, Ashe's juniper (Juniperus ashei). 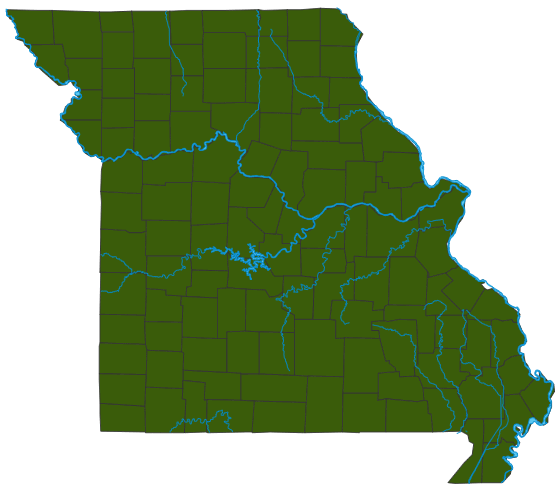 It is uncommon in the southwestern portion of the Ozarks; our populations represent the northeastern tip of its range. The margins of its scale-leaves are finely and irregularly serrated (use magnification), while those of eastern red cedar are entire (smooth). Also, the foliage is darker green than eastern red cedar and stays green through winter, and the bark is grayer. Numerous members of the cypress family (often called junipers) are grown in Missouri as landscaping plants, but they are not known to escape or become established outside of cultivation. Thus plants like Italian cypress, dawn redwood, and arborvitae are not considered part of our flora. Eastern red cedar occurs on glades and bluffs; in open, rocky woods, pastures, and old fields; and along roadsides and fencerows. In eastern red cedar, male and female cones usually develop on separate trees. Mature female cones are fleshy and berrylike, about ¼ inch long, blue, covered with a white, waxy coating. A cedar waxwing spends evenings foraging for food during a snowstorm in Jefferson City, Mo. Occurs on glades and bluffs; in open, rocky woods, pastures, and old fields; and along roadsides and fencerows. Some gnarled cedars on Ozark bluffs are over 1,000 years old. This species tends to invade glades and prairies that are not burned periodically, damaging prairie plants’ ability to survive, and ultimately turning a grassland into a forest. Prescribed burning and cutting of woody plants like cedars helps prairies and glades to survive. This is why you often see cut-down cedars in Missouri's natural areas. Researchers have determined that prior to European settlement, eastern red cedar was uncommon in Missouri's landscape and almost entirely restricted to bluffs and cliffs — places where fire could not reach it. In the years since settlement, with fire suppression and many other changes in land use, red cedar has become commonplace. Common. This tree is not technically a cedar, which is why many specialists prefer to spell "redcedar" without a letter space or else hyphenate it. Standard dictionaries strive to reflect the most common spellings used by ordinary people, and thus they present "red cedar" as two words — which most people then follow. "Juniper," of course, is a better name for this plant, as it is in the genus Juniperus, in the cypress family. True cedars are in genus Cedrus, in the pine family, and are native to Eurasia's Himalayan and Mediterranean regions. The red, aromatic wood is used for chests, closets, interior finish, posts, pencils, and other objects. An oil from the resin is used for ointments, soaps, and to flavor gin. Among the many things old-time Ozarkers used to believe brought bad luck was the transplanting of cedar trees. Folklore collector Vance Randolph described several examples of people refusing to move cedar trees because they thought it would bring an early death to them or someone in their family. It was also considered "very bad luck" to bring cedar boughs into the home — except during Christmas, and then, they had to be removed completely before 12 a.m. on January 6. Although many Missourians today purchase pines and spruces from Christmas tree farms, or use artificial Christmas trees, red cedar was the traditional favorite in many homes. And for many, it still is. The fruit is eaten by many species of birds and mammals — cedar waxwings are named for their preference for the fruits. The thick crowns provide nesting and roosting cover for many birds. As a colonizer, cedar plays an early role in transforming a damaged, stripped landscape back into a forest. When it begins to colonize fire-adapted communities such as glades, savannas, prairies, and open woodlands, red cedar becomes a land-management problem. This tree is host to cedar-apple rust, a fungus that in certain stages makes brown spots on the leaves of apple, hawthorn, and crabapple trees. On cedars, the rust is a woody, purple-brown ball that, when moist, develops golden-orange, jelly-like extensions. The rust is generally not a problem for healthy trees, though it is unsightly on its rose-family hosts and can cause problems for apple orchards.